If you thought that your credit score and credit report was only good for getting a really sweet home loan or an especially generous line of credit from your credit card provider, think again. If you’re a small business owner, your personal credit score can also help you score a business loan or a new source of short-term financing. And now a new change in credit reporting has the potential to make that option even easier. The most important thing you need to know about your credit score is that it’s comprised of different pieces. A big credit agency – like Equifax, Trans Union or Experian – uses a blend of different components to come up with a final credit score. Since each of them uses a slightly different blend of components as part of a proprietary algorithm, each one comes up with a slightly different score. Thus, one agency might give you a credit score of 650, and another one might give you a score of 670. Of course, the overall blend might be slightly different in each case, but you can see how different factors – even if only slightly tweaked – have the potential to impact your score. If the change impacts a factor like “payment history,” then you can really see a big change in your overall score, since it accounts for more than one-third of your total score. Let’s take one hypothetical example. Say that your overall credit score is 680 and you can slightly improve one of these factors by just a little bit. That might be enough to raise your score 20 points. And those 20 points would move you from a completely different category – “average credit” – to “good credit” (those with credit scores of 700+). See how just a small change can have big consequences? And now the Consumer Data Industry Association, which represents the major credit agencies, has decided to tweak this formula. It will now ask the major credit agencies to remove most tax liens and civil judgments from your credit score. And all of that has to happen by July 1. That might not sound at first like a major move, but it is going to have giant consequences for anyone thinking about getting a business loan, or line up any type of financing for their business – such as equipment funding or a factoring agreement. 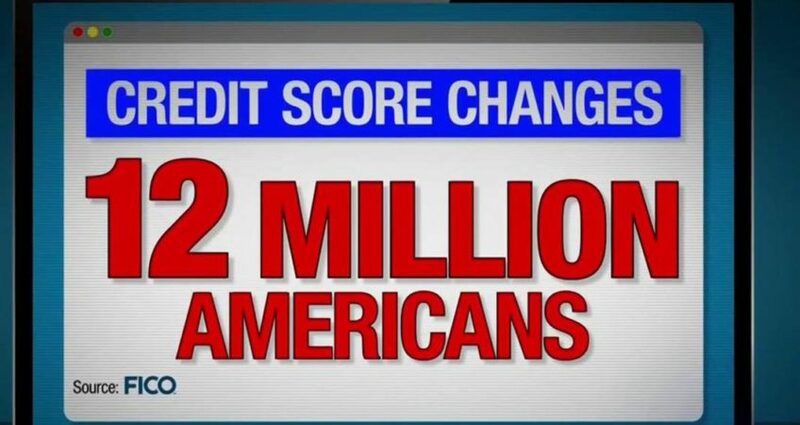 For most of these 12 million Americans, the change in credit score might only be in the range of 10-20 points. However, it’s commonly thought that as many as 700,000 to 1 million Americans might see a credit score improvement of as many as 40 points. That’s a big change. In short, millions of Americans are immediately going to be more credit worthy in 2017 than they were in 2016. And the beauty of this is that they didn’t have to apply for anything, file any papers, or submit any documents! It’s all being done for them as part of a broader plan to clean up credit reports across the nation. So, let’s go back to the hypothetical business owner who needs a fresh source of capital to grow his or her business. If a tax lien or civil judgment previously existed on a credit report, it was probably close to impossible to get a bank loan because there was no way the final credit score was going to be above 700. Lining up a loan from the government, such as an SBA loan, would also have been difficult. And getting an equipment loan or a short-term financing agreement from a source like www.smallbusinesslendingsource.com would have been challenging. But with just an additional 20 points added to your credit score – and potentially as many as 40! – you suddenly might move to an entirely new credit category. You obviously want to be in the range of 700-749, and this credit reporting change could make it possible, and as soon as this summer. Of course, you can’t just sit back and rest on your laurels. Take a day or two to celebrate your higher credit score, but realize that you still have to be proactive about monitoring your credit reports.